Cosentino, Frank. "Simon Whitfield". The Canadian Encyclopedia, 08 February 2018, Historica Canada. https://www.thecanadianencyclopedia.ca/en/article/simon-whitfield. Accessed 18 April 2019. Simon Whitfield at the 2000 Sydney Olympics, where he became the first-ever gold medal winner at triathlon's Olympic debut(photo by Robert F. Bukaty, courtesy CP Archives). Simon Whitfield was born in 1975 to Linda and Geoff Whitfield, an Australian who had immigrated to Canada and settled in Kingston, Ontario. He also has a sister, Kate. 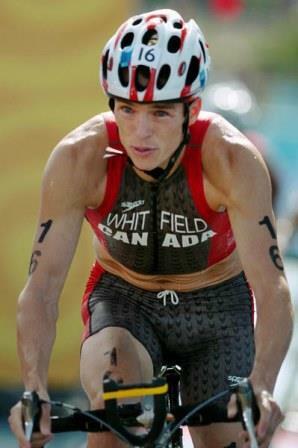 Whitfield entered his first triathlon at 12 at Sharbot Lake, Ontario, an event sponsored by the Kids of Steel program. Whitfield had told his hometown paper, The Whig Standard, that his goal was to win an Olympic gold medal in the triathlon. It seemed unrealistic at that time, since his casual approach to training made it unlikely. When Whitfield was 17, his parents decided to send him to the private Knox Grammar School near Sydney, Australia, “to refine my focus and find what it was that I wanted to do.” Geoff Whitfield had attended the boarding school, as had his own father, and his mother — Simon’s grandmother — still lived in Australia. Whitfield, known as "Simon Yank," became popular at Knox Grammar School. 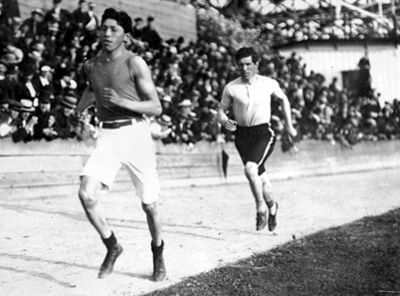 Running was his forte, and he represented the school several times, winning 30 consecutive races. At 18, Whitfield met Greg Bennett, then the best-known triathlete in Australia. They decided to train together. Whitfield kept Bennett relaxed while Bennett, a hard and tireless worker, kept Whitfield committed. With school completed, he moved back to Victoria, British Columbia, where he trained in the summer, returning in the winter to Bondi Beach, Australia, where the combination of ocean, hills and sandy beaches year-round were ideal for training. The rigorous, itinerant lifestyle of triathletes had an appeal of its own. He found himself sleeping in airports or train stations and doing odd jobs on a one-day basis, earning enough to make ends meet while devoting all his free time to his passion. Whitfield continued to improve. He became a member of the Canadian national team in 1996 and was the 1998 and 1999 Canadian champion. He also won a bronze medal at the 1999 Pan American Games in Winnipeg. As the 2000 Olympic Summer Games approached, he was offered the opportunity to compete for Australia because of his dual citizenship and his growing reputation as a top triathlete. He chose Canada. On race day, most athletes travelled accompanied by their bikes and equipment, preferring to keep them in full view at all times. In keeping with his trusting and laidback nature, Whitfield sent his ahead to the course in a cargo truck. And when the bus arrived at the Athletes' Village pickup site to transport them to their starting spot, Whitfield calmly watched the other competitors rush to board and cram themselves into the standing-room-only vehicle while he nonchalantly waited for the next one. As good a triathlete as Whitfield was, he was not the favourite for a top-three placing at Sydney. 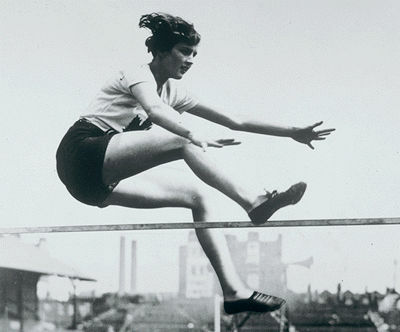 In fact, it was the Australians who were hoping to sweep the medals in this first-time Olympic sport. Whitfield had not won a major race in more than a year. His coach, Barrie Shepley, was hoping for a top-eight finish, which was more optimistic than the top-20 result predicted by the media. The swim phase was first. Prior to it, Whitfield gave his characteristic three claps of his hands. His time for the swim was 17 minutes, 56 seconds — 28th place among 52 competitors. During the bicycle phase, he narrowly averted a disaster, slowing down to avoid a collision with racers who had tangled up in front of him. Despite the slowdown, he registered a credible 58 minutes, 54 seconds. He was now in 25th place overall. His 10 km run was a stunning display of grit and effort. Stephen Vuckovic of Germany was in the lead. Whitfield marshalled his energy and ran the distance in 30 minutes, 52 seconds. One after another, he pursued and passed all those ahead of him. He sprinted to the finish line past Vuckovic to win by 13 seconds, becoming the first gold-medal winner in the first triathlon competition ever held at an Olympic Games. At the medal presentations, with many of his family members in attendance, a tearful Whitfield watched the Canadian flag being raised slowly. He was later asked to bear the Canadian flag at the closing ceremonies. 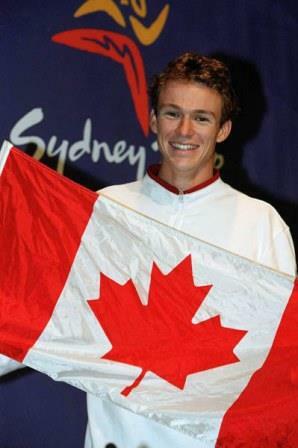 Canada's gold medalist in the triathlon Simon Whitfield, of Kingston, Ontario, is announced as the flag bearer at the Olympic Games during a press conference in Sydney, Sunday, 1 October 2000. Whitfield was favoured to defend his gold medal title at Athens in 2004 but faced a series of personal setbacks in the lead-up to the Games. One month prior to the Olympics, training partner Sean Marlowe sustained life-threatening injuries in a car accident. Less than a week before the opening ceremonies, Whitfield became ill from food poisoning. Nevertheless, he was able to compete and placed 11th overall. Simon Whitfield of Victoria, B.C., rides his bike during the Triathlon event at the Athens 2004 Summer Olympic Games Thursday, 26 August 2004. Whitfield was the Canadian flagbearer at the opening ceremonies of the 2012 Olympic Summer Games in London. Unfortunately, he crashed shortly after the start of the bicycle phase of the triathlon, forcing him to withdraw from the event. Whitfield retired from competition in 2013.